Myth: Microwaves cook from the inside out. Microwave ovens do not “cook from the inside out”, as many people say. Microwaves actually heat from the outside in, very similar to other heating methods. Microwaves are actually pretty simple devices. The core components needed for a microwave are simply a magnetron and a high voltage source. If you want to make it a little safer to use, you also add in a metal box with a waveguide (basically just a metal tube) that the magnetron is directing short radio waves, called microwaves, through into the metal box. These microwaves then bounce around in the metal box; when they encounter certain substances, like water, fats, sugars, ceramics, certain polymers, etc, these microwaves, via dielectric loss, heat up these molecules in a relatively efficient manner. Specifically, with dielectric heating, molecules that are electric dipoles, having a positive and negative charge on opposite ends, will rapidly rotate themselves trying to align with the alternating electric field from the microwaves, thus heating the molecules. This requirement for rotation is why completely frozen foods tend to heat very slowly at first in a microwave, because the molecules aren’t free to rotate. So at first, the microwaves are mainly heating the molecules that can rotate. These free molecules heat up rapidly and, by convection, thaw out some of the frozen molecules, which then get heated simultaneously by convection and the microwaves. This continues until the whole thing is cooked. As you can see from this, it would be impossible for these microwaves to somehow be emitted from the magnetron and be able to reach the center of the food substance without first going through the outer portions of the food. The misconception arises from the fact that some foods that you microwave have a very dry outer cover (such as a crust), which the microwaves penetrate with very little absorption. Thus, the liquid inside will appear to heat up first. This is one of the reasons, with frozen food, the center might remain frozen and the outer layer somewhat cool, while the layer just under the crust may be super hot. If it was truly cooking from the inside out, as many people say, you’d never end up with that frozen center while the rest was hot enough to scald. Yet another common myth surrounding microwaves is that you can’t put metal in them. 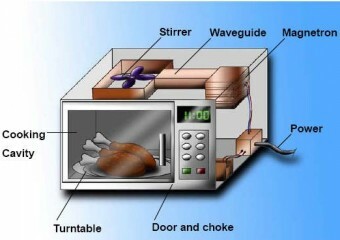 In fact, as noted, the entire inside of the microwave is just essentially a metal box with a magnetron. The very walls of the microwave are metal. You also put metal in there all the time when you cook things like hot-pockets in those little sleeves they come with (lined with aluminum powder which heats up and in turn browns the crust via convection). So why do people generally recommend against putting metal in a microwave? Well, I wrote a whole article on that here, which you may be interested in. Also contrary to popular belief, a microwave oven’s radiation does not cause cancer. The reason being is that it is not ionizing radiation. The worst it can do his heat up the water/fats/etc in your insides, which of course can cause damage if allowed to get too hot, but nothing compared to being exposed to high levels of ionizing radiation, such as x-rays and various types of cosmic radiation like ultraviolet light. Even mice that spent their whole lives exposed to low levels of microwaves at around the same frequency as a microwave oven (2.45 GHz), showed no adverse effects from the microwaves. Devices like your wireless router, GPS satellites, any Bluetooth device, and your phone also likely operate using the 2.4 GHz band, just like your microwave oven. So you are actually constantly being bombarded with the same type of microwaves as your microwave oven is using, albeit at lower levels so it doesn’t cook your insides. 🙂 This is also why when you run your microwave, you may notice those wireless devices stop working well when you get too close to the running microwave. Some of the microwaves from the magnetron are escaping and interfering with the signal your devices are using. There is really nothing special about the material the window of your microwave is made of. It’s typically just plain old plastic or glass. What stops the microwaves from cooking you, instead of your food, is the metal mesh that is on the inside of that clear plastic or glass. The holes in that mesh are specifically sized so that the microwaves can’t fit through them, but light waves in the visible spectrum can; so the microwaves bounce off and back into your microwave oven to heat the food, while the light waves go through the holes and into your eyes so you can see the food cooking. Running a microwave empty is a bad idea. If there is nothing in the box to absorb the microwaves, they will just bounce around, creating a standing wave that will eventually burn out the magnetron itself. This is also one of the reasons you generally don’t want to try cooking something that is enclosed completely in metal, like tinfoil. Too much of the generated microwaves can go unabsorbed, eventually killing the magnetron. Many microwavable foods recommend that you let the food sit for a few minutes before eating it, after cooking. This is because sometimes the food is very thick and the microwaves may not have managed to penetrate deeply and so the center may still be frozen and surrounded by a super hot outer layer of liquid. This is expected. By waiting a few minutes, it allows the super hot part to melt the frozen center and the overall temperature of the inside evens out to a level that is comfortable to eat. This is also why when you click “defrost” on your microwave you hear it kicking on and off every 10-30 seconds. You don’t want the microwave to cook the frozen object, so instead it heats the frozen object for a short period and then lets the heated part melt the inner part a little by convection. And so on until the thing is thawed. When we say that a conventional oven heats from the outside in, we are talking about a situation where the temperature surrounding the food is higher, so the heat flows literally from outside the food into it. A microwave certainly doesn’t cook from the inside out; and the energy certainly comes from the outside. But the heat goes from the outermost interior layer inward, not from the outside in. My microwave heats what it wants to, when it wants to, how hot it wants to. And it usually heats up everything but my food. I did find that greasy stuff heats up better than GRAVY. It is funky to heat mashed potaters and gravy, THANKSGIVING(!) and stuffing and the food is hot and the gravy is cold. In the fall of 1947 a fellow visited Santa Catalina Island with a contraption he said would quickly heat hot dogs and other combinations within hot dog rolls. He demonstrated this weird capability without getting any offers to purchase the device. I tried a bite, finding the sandwich hot, but not very tasty. Besides who would want one when you had a perfectly good oven at home and besides hot dogs are tastier broiled or fried. It wasn’t until years later when we purchased one that I remembered that weird device, which was a plexiglass (or plastic) rectangular box with a large tube inside to hold the bun while it heated. Wires surrounded the tube and there was another box from which the wires protruded and to which an electric cord extended to an electricity source. I don’t remember what he called it, but he claimed it was the latest technology. Do you think it was a microwave?